Coldplay are recording their fifth studio album in Budapest with their now de facto producer Brian Eno. The new record will be their follow-up to the 2008 smash Viva La Vida Or Death And All His Friends. According to the blog post on the band's website, the new tracks are "killer." 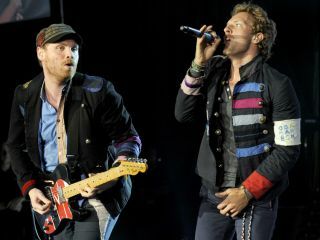 Chris Martin and his fellow Coldplayers also detail the two phases of recording process: There's "screwdriver work," during which the group deliberates over the "perfect arrangement." Next comes what they term as "happy accidents." Additionally, the post says, "Sometimes, the thing that ignites a tune appears to come completely out of nowhere - and you'd need to do a lot of retracing of steps just to work out exactly who triggered it. It could be as simple as someone playing a part with the wrong sound in error, or it could be Will noodling distractedly on his drum machine and Chris jumping on it and putting it under the verse of a song from another day." But don't expect to hear the new album anytime soon - word is it won't be released until sometime in 2011. However, fans will be able to get their fill of the band in another form this year, as Coldplay have made their entire catalogue available to the producers of the hit Fox show Glee.